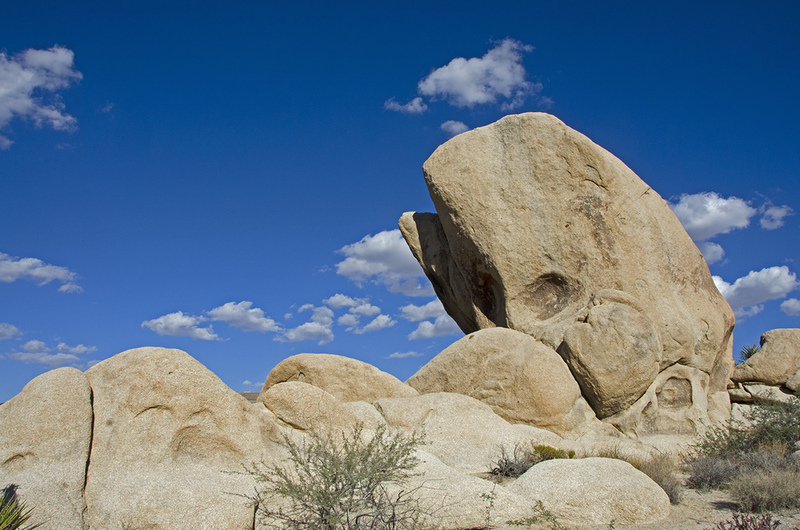 I had the opportunity to head back out to J Tree recently; my last trip had been the past 4th of July, a blistering hot day spent exploring the Car Wash near Gold Rose Well. 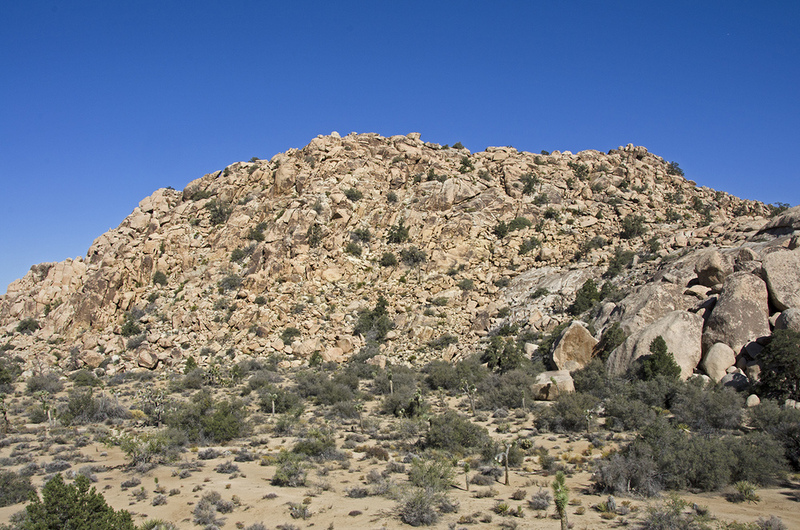 Let me say, the weather is generally much more conducive to hiking J Tree in October than it is in July. I was meeting my road-tripping cousin, Karen, as I had offered to show her a few of my favorite places in the park. We met at the Barker Dam trailhead parking lot at 9:00 am, and before we were done for the day, we had visited some great spots in the park. The weather was great for hiking: mid-70s, a slight breeze blowing and clear blue skies for most of the day, although a few puffy clouds made an appearance later in the afternoon. This pleased my cousin, as she shoots black and white and appreciates the contrast. Below the break are a few of my photos of the day. We hiked the Barker Dam loop (with an excursion out to some authentic Native American pictographs), visited Wonderland Ranch, met the Red Lady, trekked to the Desert Queen Well, the Wall Street Mill, Skull Rock, Split Rock and ended up at White Tank campground to hike the Arch Rock nature trail. 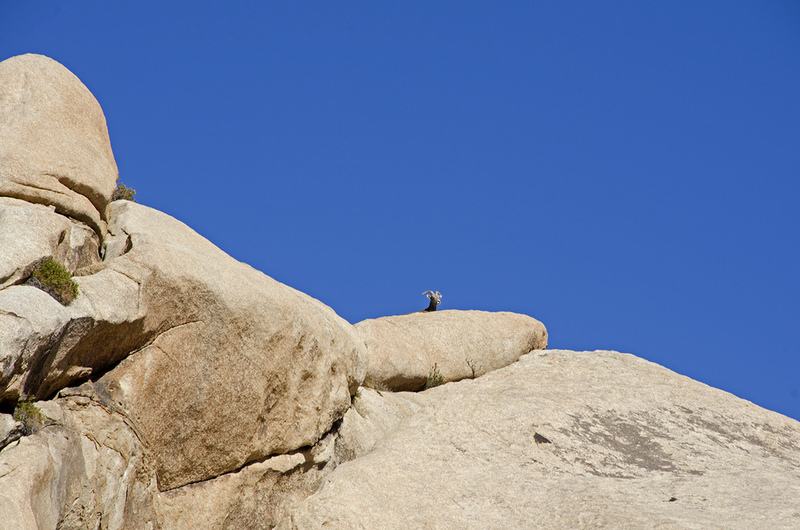 Whilst hiking the Barker Dam nature trail, we spotted a couple of Big Horn sheep up on the rocks. It's a rare thing to see them, but far away and atop rocky cliffs is the best place to look for them. All in all, a great day in the park. But then, what day out at J Tree isn't a great day?